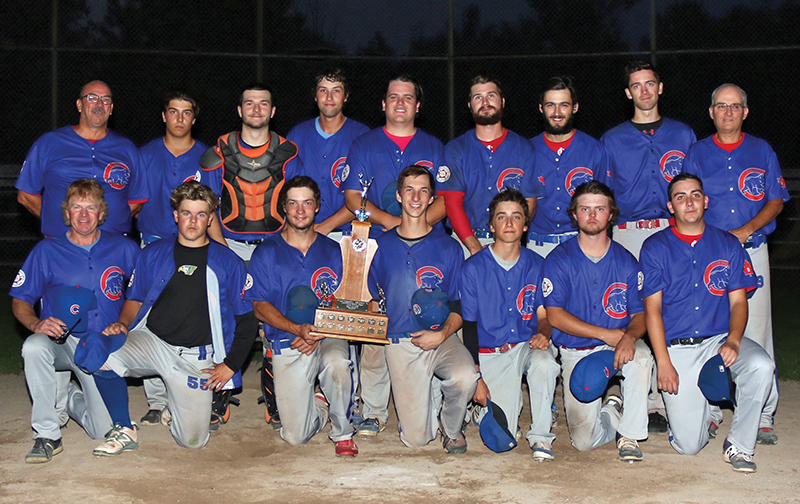 Mansfield Cubs won their second straight junior championship in the North Dufferin Baseball League on Thursday defeating the Ivy Blues in three games. The best-of-five series started Aug. 19 and was plagued by rain and unplayable field conditions throughout with three dates being washed out. Mansfield won the first game 11-3, picked up an 11-0 victory in game two on Aug. 20, and defeated Ivy 8-4 in the third and final game for the title. In the final game, Mansfield got on the board early scoring two runs in the first inning. Ivy answered with a lone run in the second frame and plated three more in the third to take the lead. Mansfield scored five runs in their half of the sixth inning to regain the lead. The game was called due to darkness in the bottom of the seventh, ending with the score at the end of six, 8-4. Mansfield hits went to Kashtin Winchester, Laird Blanchard, Jordan Metz, and two each from Jake Currie and Jeff Christman. Josh Johnston hit a double. Mitch Tucker, Tyler Huitema, Riley Stewart, and Thomas Barnes singled for the Blues with Ryan Barr and Daniel Miller chipping in with two each. Currie started for the Cubs pitching 2 1/3 innings, giving up four runs on three hits, one walk and hit two batters. He struck out one Ivy batter. Johnston finished the game pitching 3 2/3 innings. He allowed no runs, gave up five hits while striking out three. Barr toed the rubber for Blues and over his six innings, allowed eight runs on eight hits, six walks, hit one batter and struck out six. In a post-game presentation, league secretary and junior division convenor Scott Anderson, presented the Anderson Trophy to coach Dave Metz of the Cubs.